Last year, I extolled the virtues of Disney returning animation to its true form with “Paperman”, a short I was sure would win an Oscar (and it did). This year, Pixar’s short “The Blue Umbrella” presents yet another wonderfully done sweet tale of love – albeit with a twist. As the scene opens, a city starts to experience the first few fat drops of rain from an oncoming shower. Inanimate objects on the city streets begin reacting to the rain with muted joy and subtle smiles as they soak it in. Umbrellas soon emerge as the protectors of the various passers-by, mostly the generic, stalwart black umbrellas sported in every city. There’s one standout, though: a blue umbrella. This bright blue umbrella revels in the rain, clearly enjoying the shower as much, if not more so, than the other supposedly lifeless characters on the street. Waiting at a light, the blue umbrella spots another colorful protector in the crowd; a lovely red umbrella shares a shy, coy moment with the blue umbrella until they’re cruelly separated by their owners heading in opposite directions. 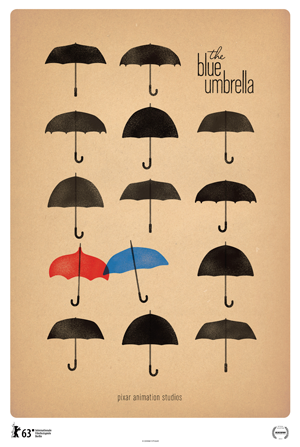 The two umbrellas are heartbroken, and the blue umbrella does his best to make his way back to his beloved – to sometimes jarring consequences. In the end, love does conquer all, even the rain, providing a wholly satisfying ending for the adorable pair. The more I think on “The Blue Umbrella”, the more I think it certainly has a decent shot at winning the Oscar this year. It’s a sheer joy to watch, and the computer graphics feel and look so real as to be wholly believable. Well, if you believe that umbrellas can fall in love…and really: why not? “The Blue Umbrella” will be shown in theatres prior to viewing of “Monsters University”, which opens nationwide on June 21, 2013. This entry was posted in movie reviews and tagged disney, movie, movie review, pixar, short film by crunchymetromom. Bookmark the permalink.